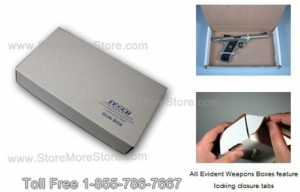 Right now, we are running a fantastic special deal on handgun evidence storage boxes and small arms evidence storage boxes manufactured by Evident. The handgun storage boxes are 13” long by 8” wide by 2” deep, which will store just about any pistol or revolver confiscated for evidence. Organized your handguns so they can be easily found with boxes specially designed for handgun evidence storage. Hurry we have limited quantities available at these prices. The Evident Handgun Storage Boxes are made for safe secure storage and transit. They are constructed from heavy-duty white corrugated cardboard and feature locking tabs that keep the lid securely closed. The integrity of the pistol or revolver is maintained because keeping the evidence in a box limits the amount of people that will come in contact with the handgun. Optional tie straps are available for securing the handgun’s in the boxes. When your handgun evidence is kept in boxes, it is easier to store on shelving or in cabinets because of the homogeneous uniform box size. You can also easily label the edge of the pistol storage box for quick identification and retrieval. Keeping small firearms in Evident Handgun Storage Boxes is an efficient and easy way for police, sheriffs, and any law enforcement agency to manage their handgun evidence collection safely and securely. We also have great prices on handgun storage lockers and cabinets. All of our handgun security lockers are built to be rugged and heavy duty enough to provide the highest level of security for weapon storage. 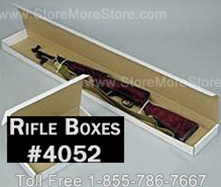 Visit us online at www.StoreMoreStore.com, email us, or call us at 1-855-786-7667 to shop for Handgun Evidence Boxes and Handgun Storage Lockers!